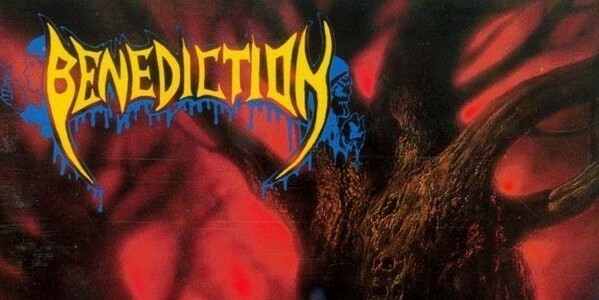 Back in the early 90’s, the underground had already woken up to Benediction’s brutal output – the release of debut album Subconscious Terror took care of that – but it was only when Dave Ingram took the place of the Napalm Death bound Barney Greenway that Benediction moved swiftly up the ranks. Benediction had found their man and an iron-lunged performance from one of the busiest men in modern death metal ironically elevated The Grand Leveller onto the same playing field as the likes of Obituary and Scream Bloody Gore era Death. Channeling ominous mid-paced groove, manic tremolo riffing and Slayer-esque dynamics, Benediction stood out from an already overcrowded scene with their dark and twisted amalgamation of the work pioneered by their US counterparts and the boundary-shattering, extreme metal experiments associated with Sacrilege, Carcass and the aforementioned Napalm Death. The UK finally had a death metal band who could deliver the kind of chugging riffs and satisfying crunch to rival their transatlantic cousins and The Grand Leveller remains an apocalyptically heavy and oppressive excursion into pure evil. While The Grand Leveller may not offer too much in the way of variety, what it continues to do is bludgeon the listener with an endless cycle of explicit violence. Dave Ingram’s vocals are as shockingly abrasive as ever and the torrent of head-bang inducing riffs conjured by Darren Brookes and Peter Rew still sound classic in construct but fresh and vital nonetheless.